The following diagram below attempts to illustrate port connections required in a working Veeam nworks architecture design. Here we just cover the default ports. This map is useful to know in an environment where firewalls are imposed with strong restrictions, and - as the implementation engineer - you may need to test that the required ports are open. Note: Below we have the Veeam nworks Enterprise Manager Server (EMS) and EMS Web UI installed on the same box (can see no reason to split these roles as not heavy hitters in terms of processing.) We have 2 SCOM servers, 2 Collectors, and 2 vCenters for illustration. It is recommended to have SCOM Agents on the nworks EMS and vCenter servers - this is not illustrated below. 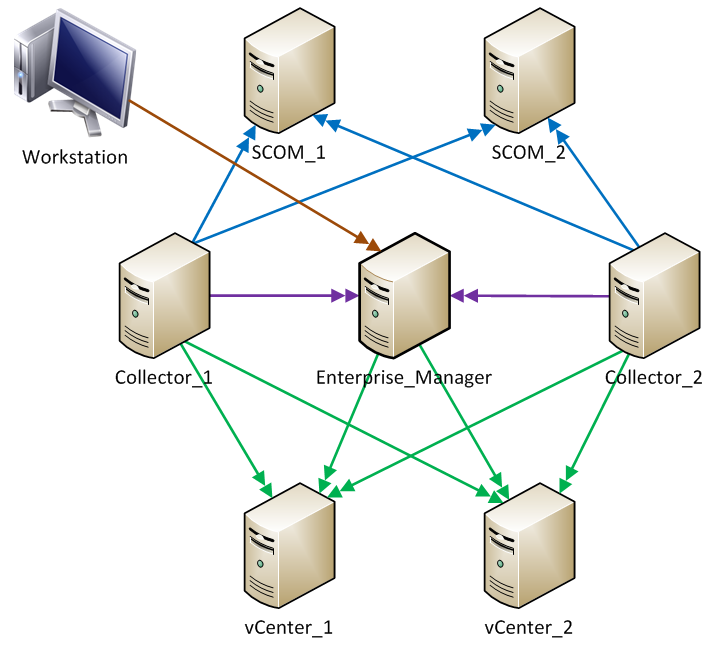 The Veeam nworks MP scales easily by adding additional collectors as required.